Pointwise will be presenting recent results obtained by colleagues at NASA Langley from aeroacoustic simulations of a nose landing gear assembly as part of the BANC-III workshop preceding the AIAA Aviation conference in Atlanta, GA. For this collaboration, Pointwise provided an unstructured, wall-resolved grid consisting of 25 million nodes (144M cells); with particular attention given to small, detailed features in the geometry relevant to acoustic simulations. The volume grid around the nose landing gear had many interacting surfaces, but algorithms in Pointwise created orthogonal elements in the boundary layers which smoothly transitioned in the volume to accurately resolve the flow. The simulation was performed at NASA using the FUN3D code to obtain the surface pressure distributions, which in turn were used to estimate the farfield acoustic signature. 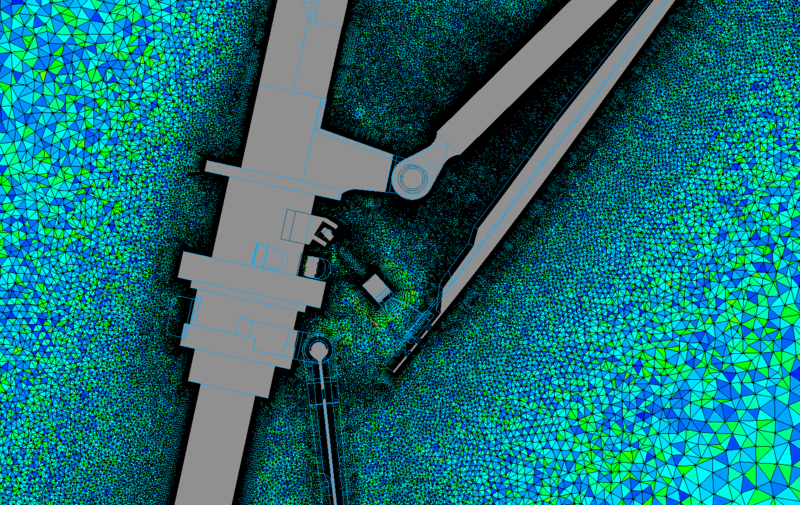 Aeroacoustic applications require unsteady solutions around complex geometries, which pose significant challenges to both CFD preprocessing tools and solvers. The workshop begins on the morning of Saturday, June 14 and continues through the afternoon of Sunday, June 15, with the session addressing the partially-dressed, closed-cavity nose landing gear pictured above falling sometime towards the end of day on Sunday. If you are participating in the BANC-III workshop or attending Aviation, please come by and introduce yourself! More information on the workshop can be found on their website. This entry was posted in Applications, Events, People & Places and tagged aeroacoustics, BANC-III, conference, workshop. Bookmark the permalink.